In 2010, Trimble was appointed by the Israeli Government to the Turkel Commission examining the IDF raid on the Gaza Flotilla which took place that year. The Israeli peace group Gush Shalom criticised this decision because of Trimble's links with the Henry Jackson Society and the European Friends of Israel. 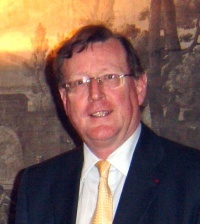 ↑ David Trimble joins the Conservatives, Conservative Party, 17 April 2007. ↑ PDF Copy of The Friends of Israel Initiative > About > Founder Members <http://www.friendsofisraelinitiative.org/about-advisors.php> created 15 July 2010. ↑ Great Hatred, Little Room, Making Peace in Northern Ireland, by Jonathan Powell, The Bodley Head, London, 2008, p19. ↑ A cover-up commission, toothless and powerless , Gush Shalom, 14 June 2010. This page was last modified on 4 October 2015, at 12:26.